In celebration of Ontario’s Local Food Week, we’re sharing some of our favourite recipes that feature local ingredients. Toronto blogger Mardi of eat. live. travel. write. was kind enough her to share her thoughts on what local means to her. With the summer season approaching, you’ll love her Beef and Mushroom Kofta recipe, made using fresh Ontario mushrooms and locally sourced Ontario Beef. 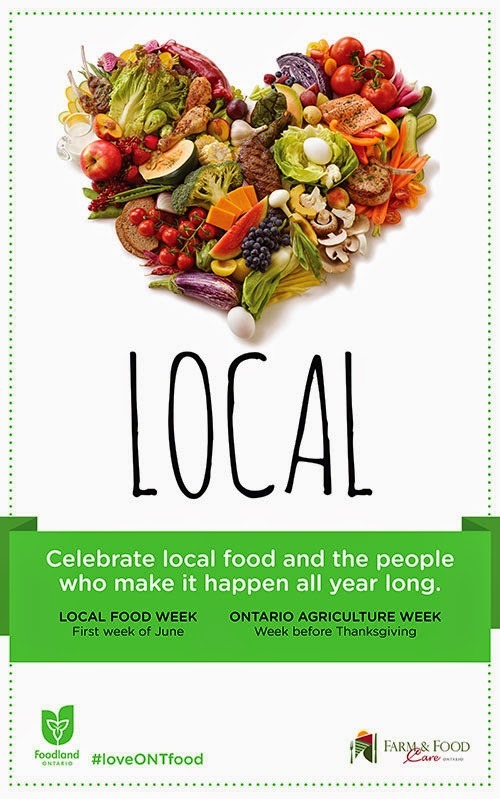 “Shopping local means choosing Ontario if possible when I am buying fresh produce, meats, eggs and dairy. For me it also means supporting the smaller businesses and markets in my area – on the weekend we don’t use our car at all and do our shopping exclusively in our neighbourhood. 1. Soak 8 bamboo skewers in water (completely immersed). 2. Place the mushrooms in the bowl of a food processor fitted with a metal blade. Pulse until the mushrooms are finely chopped. Remove mushrooms from food processor and place in a large bowl. 3. Place cilantro and green onions in the bowl of the food processor (no need to rinse it out). Process until finely chopped. Add the cilantro and green onion mixture to the mushrooms. Add the beef, ground coriander, cumin, paprika to the mushroom mixture. Now add the egg and breadcrumbs. 4. Mix with your hands until all ingredients are combined. Using your hands, take approximately 2 heaping tablespoons of the mixture and form a sausage-shape around a wooden skewer. Now place a second sausage-shape of the meat on the same skewer. The mixture will be a little softer to handle than straight ground beef but do your best! Repeat with remaining beef/ mushroom mixture until you have 8 skewers each with 2 sausage-shapes. Place on a platter, cover with plastic wrap and refrigerate. Finely chop the fresh mint and stir into the yoghurt. Cover with plastic wrap and refrigerate. Grill the kofta skewers, turning occasionally, until cooked through (do not rely on touch for these – the mushrooms make them much softer than regular burger patties or similar – you will have to cut them open to see if they are done). Remove from the grill and let them rest as you organize all the other ingredients. Split a pita pocket and place a spoon of the yoghurt in the bottom, then add 2 of the kofta, topped with some of the “slaw” and a dollop more yoghurt.